Parkland student and pro-gun control activist David Hogg has teamed up with liberal activist group Media Matters to push a boycott campaign against Fox News host Laura Ingraham. Ingraham knocked Hogg for complaining about colleges that rejected his applications. The Fox News host later apologized and extended an invitation for Hogg to appear on her show, but the 17-year-old said the apology was insufficient and continued pushing for a boycott of her show. Media Matters president Angelo Carusone helped Hogg identify Ingraham’s advertisers Wednesday night. On Thursday, Media Matters published a list of Ingraham’s biggest recent advertisers. Hogg shared the list on Twitter. “If you want to help I would suggest contacting 3-4 of these companies. Lets do this,” he added. 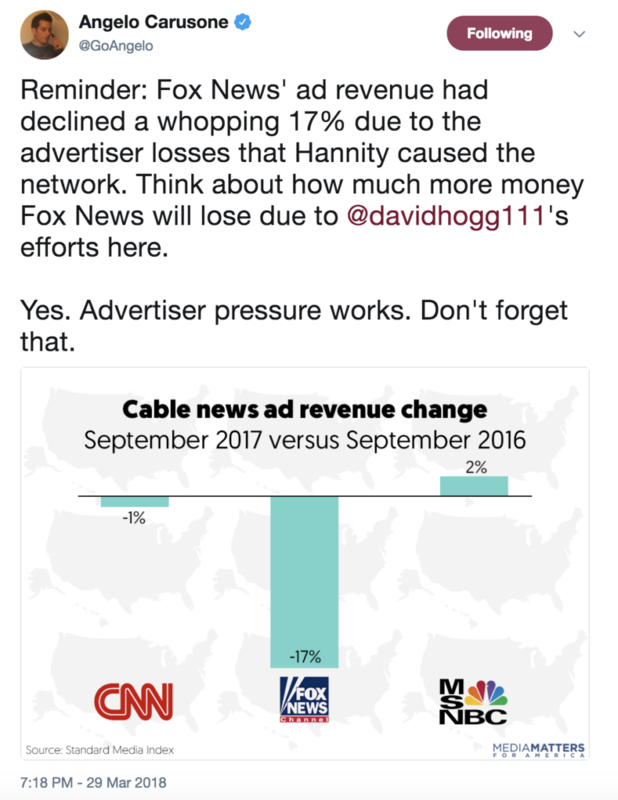 Media Matters is keeping a running tally of how many companies have pulled their ads from Ingraham’s show. That number climbed to nine by Thursday evening. Media Matters is backed by major left-wing donors including billionaire George Soros and has been waging open war on Fox News since 2009. The goal, which Carusone openly admits, is to make Fox News’ brand toxic to advertisers. Media Matters has used similar boycotts to attack current Fox News host Sean Hannity and former Fox News hosts Glenn Beck and Bill O’Reilly. The boycott against Hannity has been ongoing since May 2017. Other left-wing groups are waging similar battles against right-of-center voices in the media. Left-wing website ThinkProgress, a project of the George Soros-funded Center for American Progress, launched a similar pressure campaign against corporations with discount arrangements for NRA members immediately after the Parkland shooting. Another activist group, Sleeping Giants, has targeted Breitbart News’ advertisers with overwhelming success: 90 percent of advertisers fled Breitbart in just two months and the website has continued bleeding advertisers since then.